ONLY ONE DOUBLE ROOM AVAILABLE! This unique retreat is about enjoying and surrendering to your flow of life. Allowing yourself to go wild but also allowing yourself to create space for stillness. Finding the balance between the feminine and masculine energies within you. Letting go & receiving. For 6 nights you will be waking up and going to bed in this magical and hidden Villa, a sanctuary of peace, nestled on the mountains, surrounded by pure nature, overlooking the rural Sant Augusti valley, feeling peace and breathing the fresh, clear air. Each day starts off with an energising morning practice in the Yoga Shala of your dreams, a 65m2 Geodesic Yoga Dome, overlooking the hills and trees. Waking up & tuning in. The evening sessions will be reserved for grounding, unwinding and deep stretches. One absolute highlight of the retreat: Our Midnight Dancing Yolates Session - we will be moving and dancing through natures 5 elements while the moon and stars are watching us. #highvibes This will be a magical and a very special evening. Let yourself be surprised! Another highlight and special treat for you, which will take place on our last evening is a Gong Bath (by a special guest), allowing your system to completely calm down and letting all days fully integrate before saying goodbye and closing our retreat. Georgie from FEARLESS BODIES, our private chef will indulge us during this time with nutritious, healthy & organic food - made with lots of love & creativity. Besides our daily programme you will have enough time to explore the island and its beauty, relax at the beach or just chill by the pool, on your private terrace or in one of the cozy hammocks. Our week long experience will recharge and nourish your entire nervous system, give you new inspiration and will leave you with complete relaxation. Letting go of old and heavy energy and returning back home with lightness, new insights and a full heart. Investing in a week long get away devoted to your mental and bodies wellbeing is a true gift towards yourself. Taking time for self care and reflection, actively stepping out of your everyday life is a rebellious act in todays world, but your entire system will profit so much of this decision. It's so important to pause, take breaks and feed your mind and body with new surroundings and fresh vibes. This is why we want to invite you to get out of your daily grind and experience a higher quality of life! The retreat is open to everybody, beginners and/or advanced. Just come with an open mind and the willingness to explore, feel and have fun together. Price per Person in a Shared Double Room. Nest & Perch Early Bird* 939 € / Regular 1.039 € - already taken! Terra Cottage Early Bird* 999 € / Regular 1.090 € - already taken! Zen Suite Early Bird* 1.090€ / Regular 1.199€ - already taken! *Early Bird in a shared double room, valid until 31.01.2019. In order to secure your spot you need to pay a deposit of 400,00 € with your registration. Haven: Located in the main house. Double room with shared bathroom. Duplex Quad Room (Nest & Perch): Located in the main house. 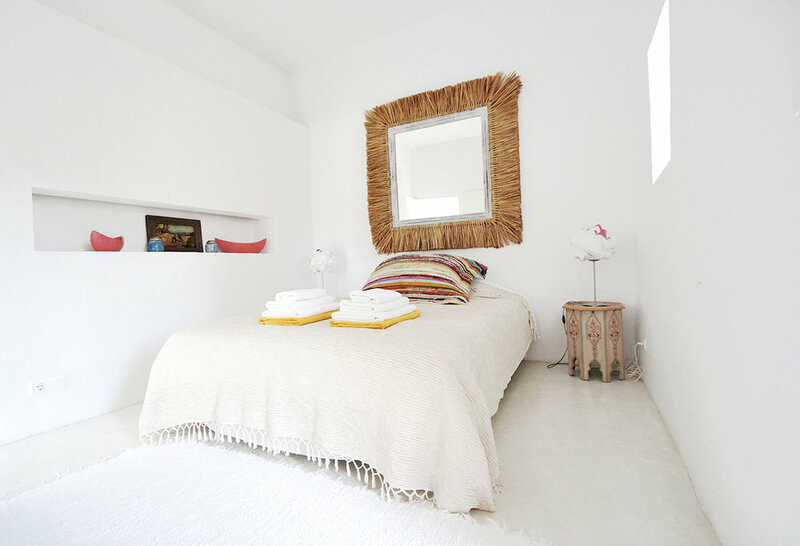 Two connected double rooms on two levels in the main house with two single beds each, with direct access to a rooftop terrace and en suite bathroom. Terra Cottage: A bungalow (double room) with private bath and terrace. It’s perfect for guests who prefer to relax and recharge in semi-solitude. Micro Suites (Yin & Yang): Each room has one queen sized bed, both rooms share a bathhouse together. Zen Suite: Double room, private en suite bath, private terrace, additional outdoor hot water shower, direct access to the swimming pool, separate access to a small inner courtyard, additional wardrobe area. *all beds can be separated, except of HAVEN, YIN & YANG. If you feel like having an extra treat, you can make a booking for an Ayurvedic massage. A 90-minute session costs 100,00 €. Please send us an email in advance if you wish to have an appointment, as the massage therapist on the island is known very well and sold out quickly. We will be living in a traditional, but luxurious farmhouse in the mountains of the Sant Agusti valley in Ibiza. Here you have a fantastic view of the valley and can enjoy the tranquility of nature. The property is surrounded by 25,000 square meters of garden with herbal beds, tress bearing almonds, figs, pomegranates and oranges. The property consists of a finca, a cottage and two outbuildings. All rooms have been lovingly and very stylishly restored and perfectly combine classic architecture and modern interior design. In the main house there is a cozy living room with fireplace, an open kitchen with dining area and another dining area on the terrace. In the heart of the property is the pool with a chill lounge waiting for you. The yoga room is located in a dome tent with breathtaking views of the valley. We will use the entire property exclusively during our retreat with our group. The retreat will be held in English and/or German, depending on the majority of English/German speakers. Photocredits: Location captured by the owner of the Villa. Food pictures captured by Fearless-Bodies.